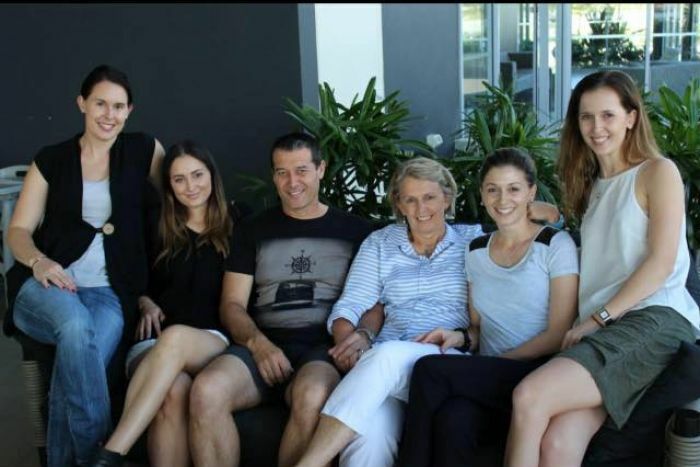 AMY Williams will gather with her sisters at their mum’s Sunshine Coast home today to celebrate what would have been her dad’s 54th birthday. Russell and Kathy celebrate a friend’s wedding in Theodore last year. They will share a beach-themed cake she is sure her police officer father, Detective Senior Constable Russell Sheehan, would have loved. She hopes they will be able to joke about the countless good times they had with their dad but knows the treasured sound of his raucous laugh will be sadly missing. Det Snr Const Sheehan’s suicide on December 23 last year shocked his family, colleagues and the wider community. He had been based on the Coast for the past 12 years of his 33-year police career, predominantly with the Maroochydore Child Protection Investigation Unit and the Criminal Investigation Branch. 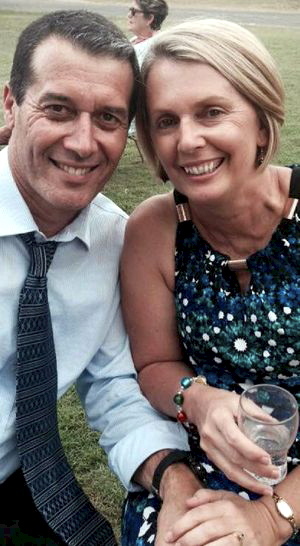 Mrs Williams, the eldest of Det Snr Const Sheehan and his wife Kathy’s four daughters, said her family was still trying to adjust without their “rock”. “We never thought he would see that as his only option,” Mrs Williams said. They knew he had been struggling in the past year and that he had sought help for depression through the Queensland Police Service and a psychologist. Mrs Williams said she had frequently been asked whether her dad’s experiences, such as being a first responder to the tragic Childers backpacker fire in 2000, had contributed to his mental health difficulties. But she did not know. “I know that Dad could not pinpoint one particular incident,” she said. She described her dad as a very proud person. “To admit he was struggling and not performing how he would like to be was hard for him,” she said. Mrs Williams said her father had always been happy at home during her childhood. “His job was a stressful job, but he never brought it home,” she said. His career took his family to postings in Theodore, Childers and the Coast. Mrs Williams said her dad was known for having a raucous laugh that would instantly make other people laugh. She said some people would go to the old cinema in Theodore just to hear his laugh when he was there watching a movie. She recalled how her dad had been able to find the humour in being bitten on the backside by an over-excited police dog during an arrest. “Dad would always find the funny side of anything,” she said. Mrs Williams said an assistant commissioner flew from Rockhampton on Christmas Eve to be with her family. There has been a steady flow of support since then. She has welcomed a charity bike ride being organised by her dad’s former colleagues to raise money for Blue Hope, a police-run organisation dedicated to helping other police. Ride for Russ, a 300km journey from Woodgate to Maroochydore, will be held on May 21. “It’s a wonderful way to honour Dad while raising awareness of suicide and depression in police officers,” Mrs Williams said. More immediately, Mrs Williams said today’s birthday celebrations were important to her family. “We just don’t ever want to stop remembering him. He is in our thoughts every day. Anyone with issues arising from this story can phone Lifeline on 131 114 or Beyond Blue on 1300 224 636. The grieving family of a Queensland policeman who took his life say the police psychologist did not have time to treat him. Detective Senior Constable Russell Sheehan ended his life two months ago after 33 years as a policeman. His daughter Amy Williams said he was widely seen as a happy, optimistic person. “He was such a genuinely wonderful person, a gentle soul, a caring soul. Constable Sheehan was also admired for his role in investigating the gruesome Childers Palace Backpackers Hostel fire that claimed 15 lives in 2000. But Ms Williams, the eldest of Constable Sheehan’s four daughters, said that was not the only trauma he experienced. Constable Sheehan had suffered anxiety over a long period. Suicides within the general population are about 12 per 100,000. In the police, it’s north of 18 per 100,000. “Some days it would be difficult for him to even leave the house, but he did,” Ms Williams said. “He was battling it very privately, he didn’t want people to know that he was suffering. Last May the anxiety became so bad that the 53-year-old found himself unable to get out of his car to go to work at Maroochydore. He went on stress leave and contacted the police psychologist for the Sunshine Coast. “She was wonderful, Dad felt an instant connection with her,” Ms Williams said. So Constable Sheehan was referred to a private psychologist. “But he always felt that the QPS psychologist really understood what he was going through a bit more so than the private psychologist he was seeing. “I’m not laying any blame on the QPS for what happened to Dad, because in the end we don’t know whether having that consultation with the Queensland Police psychologist would have changed the outcome for him. “He may still have gone down this path. Ms Williams has written to the Queensland Police Commissioner, Police Minister and Opposition Police spokesman expressing concern about the lack of resources. The Commissioner Ian Stewart is yet to respond to the ABC’s interview request. Former Queensland Police Detective Inspector Bruce Graydon said at least a dozen of his close colleagues had taken their lives over his 30-year career. Inspector Graydon co-founded a support service called Blue Hope. “Suicides within the general population are about 12 per 100,000,” he said. The real number is expected to be far worse. Inspector Graydon said police need help to retrain and find new jobs, rather than feel cast aside. The not-for-profit group Blue Hope has made links with education and recruitment organisations to assist officers that seek its help. And he agrees with Ms Williams more support is needed earlier. “We’re all for internal supports, we’re for any support, but some police officers just will not turn to internal supports so there needs to be additional options. Blue Hope has case managed more than 130 people since it formed two years ago, and assisted hundreds of others around the country. Meanwhile, in Victoria, police suicides have prompted the Commissioner Graham Ashton to order a mental health review which he hopes will lead to greater support for officers. An organisation providing mental health first aid for police officers says the demand for its services is on the rise. Detective Sergeant Andrew Ayers, the co-founder of Blue Hope, said the organisation had just helped its 177th client. “[Suicide] is a massive problem. It’s endemic to police everywhere,” Mr Ayers said. “We identified a shortfall in support services available, and that is that each law enforcement agency around the country has their own internal strategy in terms of dealing with mental health and stress in general amongst police officers. The organisation is a relatively new service that was formed in 2014 to support police officers and their families to cope with post-traumatic stress disorder (PTSD), suicide and other mental health issues. “Blue Hope basically caters for those people who aren’t for any reason, or don’t for any reason, utilise internal support strategies. We provide mental health first aid for them on a national basis,” Detective Sergeant Ayers said. The organisation’s aim is to raise awareness of police suicide and to provide a 24 hour hotline service for officers, both current and former. Detective Sergeant Ayers recently visited Bundaberg to attend and support a fundraiser organised to celebrate the life of Detective Senior Constable Russell Sheehan, who took his life in December. In 2000 the senior constable was the first on the scene of the Palace Backpackers Hostel fire in Childers where 15 people lost their lives. Detective Sergeant Ayers said it was clear Detective Senior Constable Sheehan had had a positive influence on the Bundaberg, Childers and Woodgate areas. “We’ve had some extensive dealings with his family in the wake of his tragic death,” he said. “The focus really was to have people talking about the fact that such a highly regarded police officer felt that his only option was to take his own life, and that’s the real sad aspect of it. He said the tragedy of Detective Senior Constable Sheehan’s death highlighted the need to support all emergency service workers, who were usually the first on the scene of traumatic incidents. Figures released last year revealed it was estimated one emergency service worker took their own life every six weeks. The figure, based on coronial cases, has support organisations concerned that the figure could actually be higher. In response, Beyond Blue is preparing to undertake a national mental health study on first responders to investigate the prevalence of mental health conditions, suicide and stigma in Australia. The findings of the study will be released at the end of 2017. Beyond Blue’s spotlight on mental health issues facing emergency service workers is also set to intensify next month, as the first national conference on the mental health of Australian first responders is held in Sydney. While organisations such as Blue Hope and Beyond Blue are raising awareness, so too are individuals. If I can stress anything out there to the people, to anyone with post-traumatic stress, or even if they are feeling a little bit off — talk to people, communicate. Singer songwriter Brendan Smoother, from Lismore in NSW, was horrified by the number of paramedics taking their own lives. This prompted him to write and release an EP entitled Paramedic Suicide. Mr Smoother, a paramedic himself for 21 years, won an award at this year’s Tamworth Country Music Festival for the EP. Mr Smoother said he had been inspired to write the songs when he read about the alarming statistics of paramedics committing suicide, and realised he himself had known a number of paramedics who had taken their own lives. “Personally I’ve never really had an issue with post-traumatic stress disorder, but I have certainly seen it in other people, ” he said. Former police officer, surf lifesaver and search and rescue diver Graham Forlonge, from Baffle Creek in Queensland, is one of many emergency services personnel whose life has been negatively impacted by PTSD. Mr Forlonge said he struggled to get the right help for years, due to the number and type of traumatic incidents he had experienced. “The best thing I could say to the people out there suffering from post-traumatic stress, and there are thousands of them — police, ambulance, fire brigade, rescue squad, military — is if you’re having issues, keep looking. There are people out there who do understand PTSD,” Mr Forlonge said. He said talking to people and telling his stories had helped him, and he urged others to do the same. “You’ve got to find someone to talk to,” he said. “If I can stress anything out there to the people, to anyone with post-traumatic stress, or even if they are feeling a little bit off — talk to people, communicate,” he said. Beloved husband of Katharyn. The protector, mentor and adored father to Amy, Kaitlyn, Lara and Eden. Cherished eldest Son of Brian and Pamela Sheehan. Admired and selfless brother to Anthony, Angela, Gabrielle and Chris. Adored grandfather and uncle. Never forgotten as he is forever in the hearts of those who loved him and met him. Of the Sunshine Coast Criminal Investigation Branch and formerly stationed at Bundaberg, Maroochydore, Theodore and Childers. A well respected Police Officer and Friend to many. Dearly loved Husband of Katharyn. Much loved Father of Amy, Kaitlyn, Lara, Eden and their Families. Family, Friends and Colleagues are invited to attend a Funeral Service for Russell, which will commence at 1.00 p. m. , Thursday, 31st December, 2015, at Gregson and Weight Chapel, 5 Gregson Place, Caloundra. In lieu of flowers, donations to Queensland Police Legacy and/or Blue Hope Services Ltd would be appreciated. 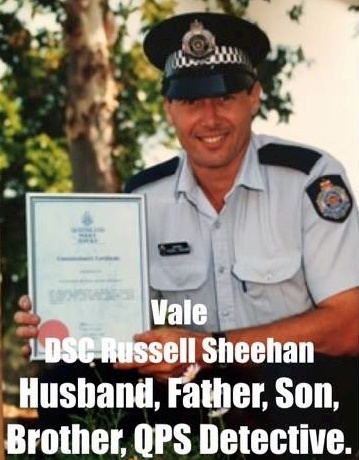 Vale Detective Senior Constable Russell Sheehan. Russell was the much loved soul mate and husband to his wife Katharyn. The protector, mentor and adored father to Amy, Kaitlyn, Lara and Eden. Cherished eldest son of Brian and Pamela Sheehan. Admired and selfless brother to Anthony, Angela, Gabrielle and Chris. Russell was also an exceptional detective with three decades of service. Our thoughts are with the Sunshine Coast police community, especially his colleagues at the Criminal Investigation Branch. The broader policing community also mourn the death of an exceptional man who will be missed by all who knew him. Rest easy Detective, your work here is done. Please Note: You can help Russell’s family celebrate his life. Funeral details will be posted in due course. Deb Bryant I’m so very saddened to hear of the tragic death of your precious husband, father, son, brother, friend, colleague. I hope in the days & months ahead that you gain comfort from the loving words and precious stories that you will receive about him & how his life & work touched so many. May these new memories sustain you as you learn to live with his loss. Craig BellchambersAgreed, and hope your doing ok One step at a time Deb. Troy Cavell One of the nicest sincere people, police or civilian, that you would meet. There are very few of Russ’s quality left in the QPS and he will be surely missed by many colleagues. Such a loss. Kathy Kucks I would second those comments. A shock to see this on FB this morning. Joey Angel Crying tears of pain for officers carrying their pain from jobs gone by . Leonie Brewer Russ was the epidemy of how a policeman conducts himself, he treated people with respect and in turn was respected, he was incredibly kind, selfless, and loved and adored his family. Darryl Rule My sincere deepest condolences to the Sheehan family and friends for your loss of Russell and to all members of the thin blue line. I lost my best friend 5 months ago to suicide who was a Detective Sergeant in the WA Police. Joey Angel Darryl i pray your best mate found peace ox im truly sorry for your loss . Here if you need a chat. Christine Troy RIP Russ. You will be truely missed mate. Top bloke, a true gentleman, never too busy to stop and say hello. My heart breaks for your family. Deepest condolences to you all. Kath Frahm Such a loss. My love and condolences to Kath and the family. I knew both Russell and Kathy from school and they were both amazing people. Life on the force seems to take such a toll. Such a loss. RIP Russell. Thank you for your service. ? Em Jay We’ve lost the most genuine, beautiful person. I still can’t believe you’re not here with us. Rest in peace Russ. Carl Christensen RIP brother, a beautiful man who now sits on the right hand of God watching over his family and friends. Melissa Craig Our sincere and deepest sympathy to Kathy, Amy, Kaitlin, Lara & Eden at this very difficult time. You are all in our thoughts. Russell was one of a kind, such a great bloke. Our thoughts are also with his other family, the Queensland Police Service. He will never be forgotten. Kevin Ongheen My sincerest condolences to Kathy and kids; Russell was without doubt the most decent and sincere of police officers whom I’ve had the pleasure to work with. I will always remember him from Theodore as an absolute gentleman. Daniel Gaskin RIP Russ. You were a family friend, great loving dad to the 4 girls and a great genuine bloke people like you and the positive impacts you had on others lifes will never be forgotten. Dan Collins No words can express the sadness and loss for a true gentleman. It was an honor to know you Russ. Rest in peace mate. Janelle Anderson Rest easy mate. You may be gone from our site…but you will never be gone from our hearts. You have touched more lives than you will ever know I am sure and you will be missed by many. And to Kath and her lovely family our hearts and thoughts are with you all. Stephen Pata Deepest sympathies to Russ’ family and Sunshine Coast CIB. Siobhan Mitchell Very shocked to hear this. RIP Russell. Deepest sympathy and all our prayers go out to the whole family. Law Zee RIP Russ…. A genuine gentleman and outstanding officer. Gone, but will never be forgotten! Suzanne Warner Deepest condolences to all who knew and loved Russell. Ian Hargrave This is so sad. I knew Russell when he worked at Childers. Such a nice guy. My sympathy to his wife and family. RIP Russell. Evets Kram Strength and compassion to both his family and workmates. Helen Welfare Love and Prayers to his family friends and colleagues ? Craig Bellchambers RIP brother in blue. You have done the hard yards and can now rest easy. Thoughts and condolences to family in this difficult time. Rusty JH Rest in peace brother. A true gentleman who will be sorely missed. brothers and sisters in blue. Jen Louise Rest in Peace Russell. You were one of the world’s true gentlemen. What a sad loss. Beth Joy Our thoughts go out to Kath and the Sheehan family. Shaz LG Thoughts are with the family and also the QPS family. Annie Rose Vale Russell. So much love being sent to your family right now. Ian Wells Still cant believe it Rusty. You were one of life’s true gentleman. At phase you always laughed at my jokes no matter how pathetic they were. Vale. Elaine Paterson Our thoughts and prayers to Kath and the girls. Micheal Jeffs RIP Russell our deepest condolences to the Sheehan Families . Iris May Vanden Berg So very sad. Leonie Brewer Russ will always be remembered for calling people kiddo!! Brett Carter My thoughts and prayers are with Russell’s family and friends. Julie-Anne Pashley Russell’s family are in my thoughts and prayers. RIP Russell. Kylie Thorpe Thoughts and prayers to his family, friends and colleagues. Very sad. Dean James RIP Thoughts with all his family and friends. Debbie Wharton Our thoughts and prayers go to this exceptional officers family, friends and colleagues . Jim OBrien Words escape me but prayers won’t. May the Lord keep you, bless you and hold you in the palm of His hand. Dianne Hart RIP blue brother. Prayers to your family. Joseph Maloney Shocked, and feeling fortunate to have had the pleasure of catching up with this exceptional man again recently. CJ Mac One of the nicest guys you could ever hope to meet. Rest easy Russ. Julianne Fitzsimon Very sad to hear this news. Thank you for everything you have done for the public. I wish we could have done more for you. Jody Tovey Rest easy blue brother. From your brothers and sisters in the west. Karen Tovey Rest in peace friend, your work on earth is done. Robbi Turk RIP Officer Russell.. I am just a member of our Qld Community saden by an officer passing. Thank you. Melissa Messenger How very sad. My thoughts are with his family. Kris Zwart Thinking of you Kath & family. Sue Cannon Deepest sympathy for a wonderful family. Eloise Jane A beautiful man. Kind to everyone regardless of age, gender, rank, uniform/plain clothes. If only we had realised the extent of his struggle. Bec Bailey Thoughts and prayers to the Officers family, friends and work colleagues. May his spirit fly free and peace be with him ? Elizabeth Jenarah Anne , words just don’t cut at times like this. Thank you fir your service to humanity and your love for your beautiful family . Robert Murphy Totally agree with previous comments. Just a good guy who never had a bad word about any person. Russell you will be missed. RIP mate. Marvin Smith RIP Russ gone to soon mate ..
Kerri Butler R.I.P. Russell. Thoughts are with the family. Peta Yarbie RIP Detective. Hope you have found peace. Karen Levine Rest in Peace Russ . Garry Law He was part of a noble profession. R.I.P. Barbara Buckman So sad to read this. Rebecca McDonald RIP. Terrible end to Christmas. Antonio Lobo R.I.P brother in blue. Leigh Finzel So very sad. In faith and service, your family is in our prayers from Canada. Rachael Wright Holly Perry I think this is what your mum might have been looking for. A TWO-week police hunt for a 30-year-old man ended when he was found enjoying a beer in Maroochydore. The Maroochydore man has been charged with 37 offences, including 10 counts of stealing, six counts of break and enter and three counts of resisting arrest. Police found him drinking a beer at a hotel yesterday. Police allege the man committed offences which date back to November. The 30-year-old man has also been charged with fraud, evading police and dangerous operation of a motor vehicle. Police say the alleged offender stole a black Nissan utility and drove it around various locations on the Sunshine Coast where he committed offences. Sunshine Coast property crime squad Detective Senior Constable Russell Sheehan said the arrest ended a two-week police hunt. Snr Const Sheehan urged residents to contact police if they witness any suspicious activity. The accused man was held in custody. He will appear in Maroochydore Magistrates Court today. POLICE are searching for a teenager suspected of breaking into a Buderim home. Detective Senior Constable Russell Sheehan said the young man grabbed fishing equipment and tools which he slipped into his backpack. The brazen effort was during daylight hours, about 3pm on November 14 last year. Det Snr Const Sheehan said because of the time of year, the suspect’s moustache may have been in honour of Movember. The thief is believed to be Caucasian, aged between 16 and 17, 175cm tall, of average build with short and straight brown hair. He was wearing a blue shirt, dark coloured board shorts and thongs at the time and carrying two black bags. One was a backpack and the other a sports bag.